The Cypriot government cabinet approved a draft bill banning online gaming including poker. Persons or companies found guilty of breaching the incoming law would be libel for a fine of up to €170,000 and/or five years in jail. Frenchman Davidi Kitai took down the World Poker Tour Celebrity Invitational at the Commerce Casino in L.A.. Kitai bested 482 players including heads-up opponent Almira Skripchenko to receive $100,000 for first place. Erik Seidel was back in the news this time for taking the title of 2011 NBC National Heads Up Poker Champion. The eight-time WSOP bracelet winner added $750,000 to his winnings. Seidel had finished runner-up in this event in 2010. 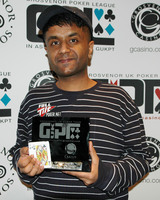 Praz Bansi won his second Grosvenor UK Poker Tour title at the GUKPT London £1,500 main event. Bansi topped a field of 245 to take home £101,020. The Nevada Gaming Control Board said OK to a relationship between Caesars Entertainment, owner of the World Series of Poker brand, with subsidiaries of 888 Holdings LLC. The deal would be the first of its kind for a Nevada license but was yet to be approved by the Nevada Gaming Commission. The European Union published a Green Paper on online gambling, which served as a draft law and a basis for discussing the options for future regulation across EU markets. Victor Ramdin claimed his first major tournament title since 2006 when he took down The Big Event for $500,000. The Dutch Government confirmed it was opening up and regulating the online gaming market including poker. Gus Hansen brought his 2011 earnings to $4.4 million, winning $1 million in a week across a slew of pot-limit Omaha and limit deuce-to-seven triple draw sessions on Full Tilt Poker. Wynn Resorts announced its entry into a “strategic relationship” with PokerStars. The statement said that following the passage of federal legislation “the parties will jointly operate a regulated, US online poker site under PokerStarsWynn.com”. Vladimir Geshkenbein is crowned the European Poker Tour Snowfest champion. Full Tilt Poker entered into a partnership with Fertitta Interactive, an entity established and co-owned by Station Casinos’ founders. Tags: Poker News, March 2011, PokerStarsWynn.com, Vladimir Geshkenbein, Gus Hansen, Victor Ramdin, Praz Bansi, Erik Seidel, Davidi Kitai.